who recently became a chess champion in New York, to his office. who has turned into a major web sensation from US to Nigeria, makes over $100,000 up in only two days as per reports released by AYNAIJANG NEWS on19th of March 2019. 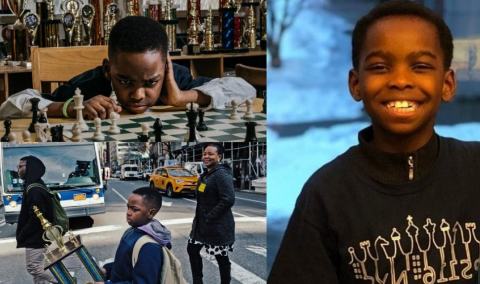 A weekend ago, New York Times feature writer, Nicholas Kristof, composed widely about Adewunmi's noteworthy ascent in Manhattan, and how he won his category at the New York State chess title. Adewumi, whose family fled Nigeria because of the Boko Haram crisis, became an internet sensation in Nigeria, as the country began celebrating him via multiplatform media coverage. Kayode Adewumi, Tani’s dad, says his son told him that he “wants to be the youngest grandmaster”. The account, which was set up March 15, has been fund-raising for two days after it was set up, and has succeeded in raising $101,873 as at Monday, with donations from “1,737 people in 2 days”. This is more than double the initial target of $50,000. So good!